It’s no blarney. Emerald green is the hot color this spring and not just for St. Patrick’s Day. 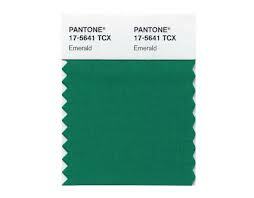 Pantone, the creative industry’s color authority, has designated this radiant jewel tone as the 2013 color of the year in its Fashion Color Report. Emerald foliage: Be lavish with green foliage favorites like hostas, ferns, heucheras, canna lilies and begonias. Plant them in mass or fill up containers in monochromatic color schemes. Emerald flowers: When it comes to flowers, green is harder to find. Look for Zinnia ‘Envy’, Bells of Ireland (Moluccella laevis), Gladiolius ‘Green Star’, Helleborus ‘Green Gambler’, Alocasia ‘Green Velvet’, Hydrangea ‘Limelight’, and Echinacea purpurea ‘Green Jewel’. Emerald accessories: Dress up porches and patios with pillows in trendy green trellis patterns or oversized botanical and flame stitch prints. Try spray painting a chair or bench emerald green. Shop for green pots or candles in recycled wine bottles. Even create a table top mosaic in emerald jewel tone tiles.